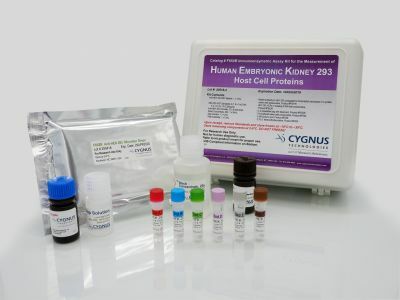 The Cygnus Technologies Multi-Analyte Controls MAC™ product is designed to serve as a set of controls that span the analytical range of four popular Cygnus HCP assays. MAC can also be used to trend the performance of each of these four assays over time. The controls are designed to be used with CHO HCP ELISA Kit, 3G (F550); E. coli HCP ELISA Kit (F410); HEK293 HCP ELISA Kit (F650R), Mix-N-Go™ Protein A ELISA (F610). The MAC set (1 ml x 3) consists of three control combinations provided at low, middle and high concentrations.